While much of the world didn’t bother to look or investigate, Newsday did the responsible thing and got the truth from the victims who had to face disgusting acts from the Friedmans. 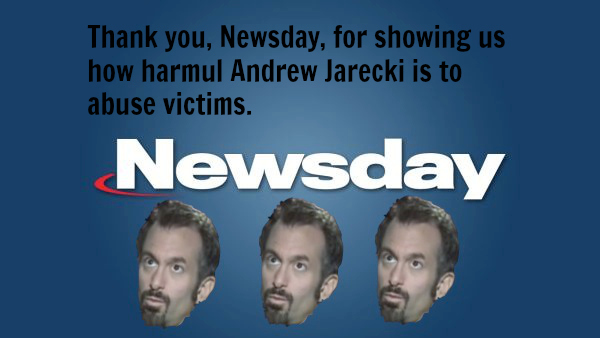 Newsday spoke to the victims, who had no choice but to relive the worst days of their lives since Andrew Jarecki decided to create a film that painted them as liars, when in fact it is Mr. Jarecki that is the liar. “My testimony was twisted in the movie, and I am here to set the record straight that this did happen and I am not afraid,” said Gregory. The film and the court challenge have brought pain and outrage to the young men in their 20s trying to rebuild their lives. It has reluctantly brought them out of their silence. And, for the first time since the case surfaced, many of them are commenting on the documentary and the court motion — one in his own voice, one through an interview with his parents and his own written statement, and four through a lawyer hired to speak on their behalf and protect their privacy. The six reached by Newsday say the film is misleading, and they want Jesse Friedman’s conviction to stand. The victims have been rightfully backed up by law enforcement officials as it continues to be pointed out that Jarecki lied and omitted facts when producing the film. Director and co-producer Andrew Jarecki has been criticized by law enforcement officials, the boys who testified, and those close to them for allegedly manipulating crucial facts and leaving others out entirely to enhance the dramatic effect of the film. Goldstein isn’t mentioned, and the accusers appear only briefly in the film. The retired detective who led the investigation, and appears in the film, now wishes she had never cooperated with Jarecki. “I regret the effect on the victims,” Frances Galasso said. “To call Jarecki’s work an investigation is ridiculous because he didn’t speak to most victims. How can you interview two victims … to say it didn’t happen,” said retired Judge Abbey Boklan, who heard the original case. The full article revealing the truth about Andrew Jarecki can be read here.